The national drink of Bermuda is not only delicious, it’s trademarked! It’s always fun to sample the national drink of any travel destination: We’ve fallen in love with pisco sours in Peru, tequila in Mexico, dawas in Kenya and rosés in Provence. We’ve also enjoyed sipping regional drinks whose names are synonymous with the wines and spirits produced there, like Cognac, Bordeaux, Burgundy and Chianti. When we arrived in Bermuda, we didn’t know what to expect of the island’s cocktail culture. Then we discovered the Dark ‘n Stormy, the national drink of Bermuda, made with Gosling’s Black Seal Rum and ginger beer garnished with a slice or wedge of lime. Rum-based drinks tend to be popular in the Caribbean and South America (the world’s two largest producers of rum). While Bermuda’s island culture bears some similarities, it’s too far north to be considered part of the Caribbean collection. Contrary to what you might think, Dark ‘n Stormy has nothing to do with the hurricane season that threatens the idyllic island from June to October. Rather it refers to the 80-proof “dark” Black Seal Rum and “stormy” (frothy) ginger beer used to prepare the cocktail. 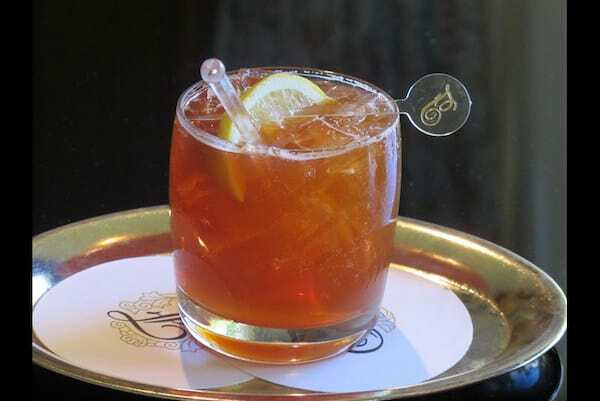 The Gosling Brothers, who actually went so far as to trademark the name and ingredients for the Dark ‘n Stormy, have produced rums in Bermuda since 1806. They’ve also impressively maintained an iconic retail storefront on Front Street in Hamilton since 1824, handed down over seven generations. When the Hamilton Princess Hotel opened its doors in 1885 (nicknamed The Pink Palace), the Gosling’s rum served there was packaged in champagne bottles salvaged from the British Naval Officer’s Mess, re-corked, and resealed with black wax—hence, called Black Seal Rum. On a play with words, the company also incorporated a black seal image in their logo. The tradition of ginger beer was a gift from the British military as well. They made the brew by fermenting ginger, spice, yeast and sugar. Gosling markets its own brand of the non-alcoholic, naturally sweetened and carbonated beverage. Our virginal experience took place when the ingredients and instructions were left in our room at the Hamilton Princess in Bermuda as a turndown amenity. Too tempting to turn down! The instructions are easy enough for even a neophyte mixologist but if you are lazy or extremely thirsty after a day at the beach, you can also pop the tab on a Dark ‘n Stormy 8.4 oz. cocktail-in-a-can, containing 9% alcohol. In a glass filled with ice, add Stormy Ginger Beer and top with Black Seal Rum. Garnish glass with (optional) slice or wedge of lime. Have you tasted a “national drink” that has become a favorite of yours? Celebrating National Margarita Day on February 22 – Salud! I’ve never been to big a fan of a Dark N Stormy, but do love the visual when a bartender drops the rum in and it floats down (or is that the ginger beer?) My favorite national drink would have to be a mojito from Cuba, from a rooftop overlooking the Malecón in Havana. Yes please, take me back now. I’ve never tried a Dark n Stormy, but it got me thinking what would be Canada’s signature cocktail? That would probably be a Caesar (Bloody Caesar) made with vodka and Clamato juice. I’m not much of a drinker, but I would definitely enjoy trying local specialties. I love a good dark and stormy! I’m sure it tastes better in its homeland than the ones we mix! It’s great to learn of the history of the Goslings. There is something special about sipping or tasting something at the source! I loved trying a Dark ‘n Stormy or two when I was in Bermuda. Really refreshing and not too potent either! Doesn’t it seem just perfect for the setting? I love Dark & Stormy’s and I love Black Seal rum. I got introduced to both while in Newfoundland a number of years ago. Thx for this great post, Irene. Wow! Didn’t know it was popular up North! It’s been 41 years since I was last in Bermuda and I was too young to drink alcohol but THIS is a drink I would love….especially now, in the summer heat. I stayed at the Hamilton Princess Hotel too so I certainly connected with your post. Now I’m going to be on the lookout for the 8.4 oz. cocktail-in-a-can, but I have no idea if it’s available in Canada or Ontario. We’ll find out! In the meantime….Rose wines! I think it’s distributed elsewhere but I’m not sure! I had my first Dark ‘n Stormy in Bermuda just before a hurricane hit, so I prefer that story! And I have noticed the drink on several menus recently. And since you asked, my favorite drink is a mai tai, which I measure by those I’ve had in Hawaii. So far the only one I’ve had on the mainland which was up to snuff is the one at Trader Vik’s in Oakland, California. Hope you got out before the Hurricane! Bobb Chin’s in Chicago has a legenday mai tai that is served in a souvenir cup. I don’t drink, but I really enjoyed learning about this cocktail and its history!! I had no idea that the Dark N Stormy had such a storied past. I’m a huge fan of ginger beer so I’ll have to try one and see. I really enjoyed the Rum Punch in Nevis but you have to be careful because they sure can pack a powerful punch! I think you’ll like it if you are a fan of ginger beer!